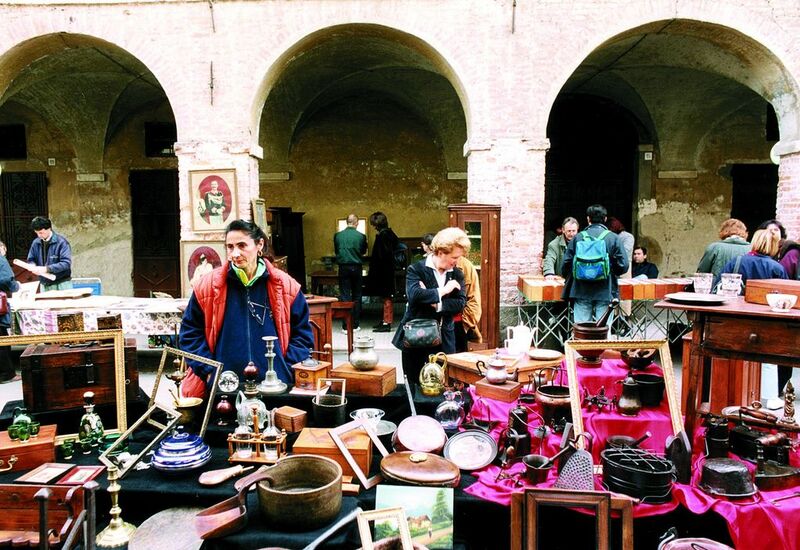 Three times a year in March, September and December Antique and Collectibles enthusiasts gather in the historical center of Cherasco throughout the day to sell their wares. From the earliest hours of the morning all the way until sundown, the streets are full of stalls (600) scattered everywhere- under the arches, on the sidewalks, along pedestrian side streets, at the foot of the historic buildings, in the piazzas. The variety of collectibles for sale is varied and abundant - market offers everything from furniture of all kinds,shapes and sizes, tables and coffee tables, cabinets, chairs, sofas and armchairs, beds, mirrors, paintings and prints, frames, books and even records impossible to find in today's market. There are also fabrics, lace and embroidery, old toys and model railways, naval and aircraft memorabilia, military objects, collections of different objects, glass and ceramics, antique lamps and chandeliers, etc. In short, there is something to satisfy every taste! Discover elements to re-use for their original purpose or re-adapt for other uses. Antique lovers can find quality items and take advantage of this special Market Day to walk along the beautiful streets of the city.